Manhattan skyline the day after Hurricane Sandy hit. Only Goldman Sachs headquarters had power. We Need A Workers Revolution! Major disasters, whether “natural” or man-made in origin, serve as an x-ray of the societies in which they occur, laying bare the social contradictions that run like seismological fault lines through them. Hurricane Sandy, which battered a large swath of the Northeastern Seaboard of the U.S. this past October 29 is a stark example. Eight million people were left without electrical power and tens of thousands were trapped in New York City public housing without light, heat, water, elevators or telephones to communicate with the outside. For some in lower Manhattan the nightmare lasted for days, but weeks later thousands in hard-hit areas of Brooklyn, Queens and Long Island are still living precariously as winter comes on. From the Galveston hurricane of 1900, which wiped out the Texas boom town, and the San Francisco earthquake and fire of 1906 to the 1985 Mexico City earthquake, the 2004 Indian Ocean tsunami, Hurricane Katrina which devastated the poor black neighborhoods of New Orleans in 2005 and the 2010 earthquake which flattened the vast slums of Haiti’s capital, thousands, tens of thousands and even hundreds of thousands of people died due to criminal lack of preparations, shoddy construction and dangerous location ultimately caused by an economic system of production for private profit. Who died and who lived was greatly influenced by class and race, with the poor and oppressed jammed into precarious structures in hazardous areas. Of the many iconic photos of Sandy’s aftermath – Seaside Heights, NJ awash, Point Pleasant, Queens smoldering following a fire that destroyed over 100 homes, the tunnels into Manhattan submerged – one stands out for its stark symbolism. A picture taken by a Reuters photographer shows the Manhattan skyline as a dark silhouette due to power outages, with the exception of a single skyscraper – the global headquarters of financial vampire Goldman Sachs seems to have every light in the building on. As Lower Manhattan temporarily became the latest New York neighborhood (“South of Power”), the first priority of the government was to get Wall Street up and running. 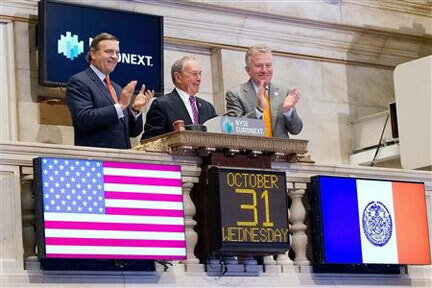 Mayor Michael Bloomberg rang the opening bell of the New York Stock Exchange two days later, while nearby Chinatown was in the dark for a week. Meanwhile, residents of low-lying poor neighborhoods and housing projects waited weeks for electricity, heat and in many cases water. 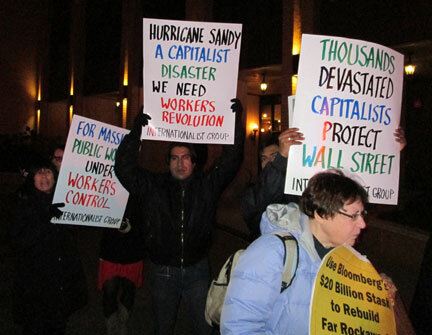 The devastation of Hurricane Sandy was magnified as it hit the economic and media center of world capitalism, New York City. 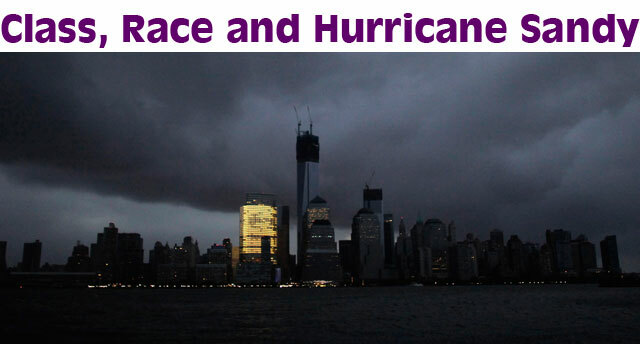 It became fashionable in the bourgeois media, after the obligatory reference to the role played by climate change in creating this superstorm and a tip of the hat to Charles Dickens, to note in a vague populist way that post-Sandy NYC was a “tale of two cities,” starkly divided between the rich and the rest before, during and after. With millions subjected to deprivation and fear while the lights blazed in Manhattan from Midtown north, it was all too true. On the affluent Upper East Side it was party time, as residents ordered in lavish spreads from high-end food museums. Meanwhile, thousands walked for miles daily from the darkened netherworld to the land of light north of 40th Street. Those who couldn’t get out – including the elderly, disabled, residents of high-rise public housing and tens of thousands in coastal areas of Brooklyn and Queens – were stranded in their dark, cold abodes, many without food, water and medicines. And soon the temperature began to drop. Sandy was quickly labeled “Frankenstorm,” yet the wind and rain were weaker than Irene, which hit Brooklyn last year. The far greater destruction and casualties (130 dead in the U.S., over 100 in Haiti) were primarily due to the failure and refusal of an arrogant ruling class to carry out measures to prepare for such a storm, and “malign neglect” toward its impoverished victims. Following Irene, proposals had been made by official commissions to carry out a number of measures, some costly (sea walls and flood gates) and others less so (sealing off tunnels, subway entrances and gratings in likely affected areas; elevating public housing boilers and electrical equipment). But nothing was done. Sandy was yet again an “unnatural disaster” like so many in the past decade, whether attributable to global warming or not (i.e., hurricanes, tsunamis and earthquakes), in which warnings were ignored and the death toll multiplied by capitalist-induced chaos, skimping on infrastructure and not only callous indifference towards those affected by it but even a deliberate desire to remove “unwanted” populations. Take the medical system. Five New York City hospitals (NYU Langone, Bellevue, the Veterans Affairs, Beekman Downown and Coney Island) had to be evacuated and several are still closed. City officials kept most of them open at first because of the cost of evacuating, but power systems failed and basements were flooded within the first hour. As elevators were knocked out at Bellevue, hospital personnel performed heroically. A bucket brigade carried fuel up 13 floors to backup generators, and when those failed they ferried hundreds of patients down in plastic sleds, sometimes hand-pumping oxygen as they went. Under FEMA standards hospitals are supposed to hold out for four days with backup power, but NYU and Bellevue didn’t even make it through Day 2. Moreover, New York is supposed to have a “surge” capacity of 4,000 beds for 8 million people in an emergency. But with all the hospital closures (over 160 closed in recent years, only 60 left) it has nowhere near that. Now emergency rooms and surgery wards around the city are overflowing with beds in the hallways and lobbies. The devastating consequences of Hurricane Sandy hit what the New York Times daintily refers to as “pockets of misery” – overwhelmingly neighborhoods of black, Latino and immigrant working people, such as the Russian community in south Brooklyn. This is one more reflection of the “one-sided class war” being waged by the masters of capital against those they mercilessly exploit. Going forward, the captains of Wall Street, the corporate CEOs and the bourgeois politicians who represent their interests – epitomized by Mayor Bloomberg, the wealthiest person in the city – fully intend to ensure that any reconstruction occurs on their terms and that, as with the costs of the world depression they set off, the burden for this is placed on the shoulders of the working class. Unless they are stopped, that is. And that requires en effort to raise consciousness that beyond immediate relief what’s needed is to mobilize those who produce the fabulous profits in a struggle for state power, for socialist revolution to sweep away the capitalist rulers and their system of production for profit and institute a system in which instead production is to fill human needs. Given that this disaster struck during a hard-fought presidential campaign, it was clear that the Democratic administration of Barack Obama would avoid the appearance of cruel and deliberate obstructionism and outright incompetence displayed by George W. Bush and his minions during Hurricane Katrina in 2005. Generous promises of financial aid were made, deals were struck with Republicans Bloomberg and New Jersey governor Chris Christie. But what New Yorkers in hard-hit areas noticed most in the first days was mainly the absence of a government presence (or even of official aid organizations like the Red Cross) on the ground in terms of actual relief. For all the hype about uniformed “first responders,” the fact is that with thousands of lives at risk, this vital work was left to private volunteer efforts such as People’s Relief in Coney Island, and in Red Hook and the Rockaways sections of the Occupy movement that Mayor Bloomberg’s uniformed thugs had driven off the streets. It is now confirmed that this was a conscious decision by city authorities, no doubt attracted by the fact that they could get all this volunteer labor for free. But there was more to it than that. Bloomberg ran true to form, advising New Yorkers: “Have a sandwich out of the fridge. Sit back, and watch the television” (New York Times, 29 October). Maybe in a town house on East 79th Street but not in the projects in Red Hook where they didn’t have power for the TV (or the fridge). Even Bloomberg’s fall-back option of reading a “good book” was not very practical for those suffering in the dark. It was like during the December 2010 blizzard when he said that city residents should relax and maybe take in a Broadway show. He then compounded his Marie Antoinette moment by trying to maintain the New York City Marathon in the face of mounting public indignation. The run would have started in Staten Island where corpses were still being uncovered and shut down the Verrazano Narrows bridge during a transportation crisis provoked by flooded tunnels. What’s more, there were dozens of huge generators as well as heaters, blankets, jackets, food and 50,000 bottles of water in Central Park for the finish of the race. City workers complained but when the right-wing, racist New York Post (2 November) lambasted this “Abuse of Power,” he finally caved. Even after the Marathon was cancelled, the equipment did not end up at the projects. The mayor initially did not want the Federal Emergency Management Agency (FEMA) butting into “his” city. 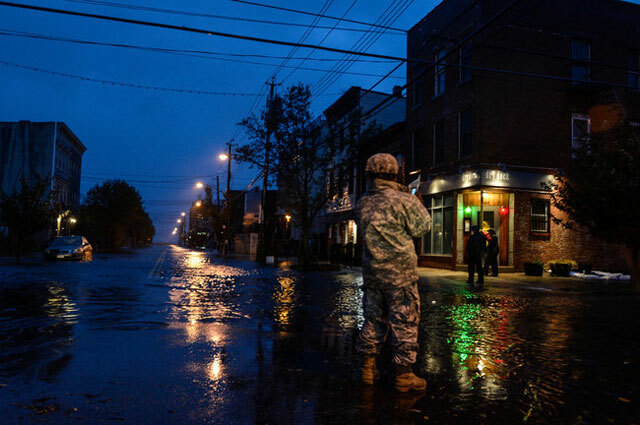 Since the FEMA is primarily a coordination office for relief efforts and financial aid, this primarily meant the National Guard as actual manpower. Where the Guard was deployed, for example in Long Beach, Long Island, next door to the Rockaways, it was not to aid victims but to lock down the town (as an Internationalist Group comrade who is a tow-truck driver reported from the scene). Replying to Brooklyn Borough President Marty Markowitz’s panicky call for the Guard to “deter criminal activity,” Bloomberg declared, “The NYPD is the only people we want on the street with guns.” After all, as Bloomberg put it last November, “I have my own army in the NYPD, which is the seventh biggest army in the world.” So both Markowitz and Bloomberg spread the racist scenario reminiscent of Katrina, according to which white people “find” but black people “loot” groceries and other desperately needed supplies; they only differ on whose guns should be deployed. A key issue was the vicious neglect of the housing projects The billionaire mayor dismissed all complaints. On November 9, he declared: “By tonight or tomorrow, every one of their buildings will have electricity and by early next week they will all have heat,” adding we now “do not have to worry about” these people. In fact, not until nine days after Bloomberg stopped “worrying” (but doing nothing) about project residents were heat and hot water restored to all New York City Housing Authority (NYCHA) buildings. Even more offensive was NYC deputy mayor Howard Wolfson, who blamed housing project residents for their woes because they didn’t leave when the city issued an evacuation order … and cut off electricity and heat even before the hurricane hit. Our “expectation and goal is people would leave these buildings” said Hillary Clinton’s former chief of staff. So why didn’t they leave? Some were disabled, unable to walk down 19 flights of stairs; others were worried that their homes would be ransacked, as happened after Hurricane Irene. And many, it turned out, didn’t speak English. So thanks a bunch for your “worry,” Mayor Bloomberg. When he tried for a photo-op by visiting the Rockaways on November 3, he got the angry non-welcome he so richly deserved. 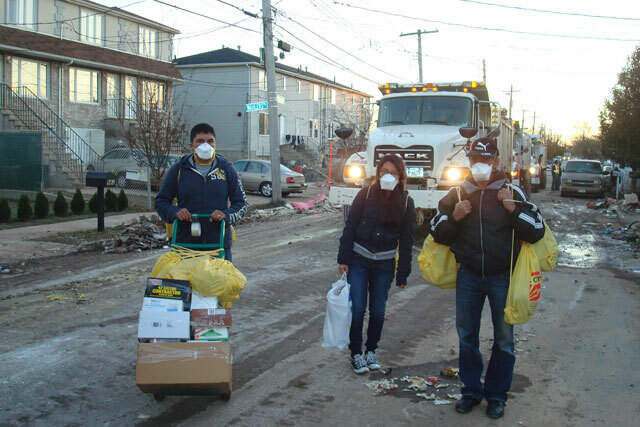 Day laborers from El Centro del Inmigrante distribute aid, Midland Beach, Staten Island, November 6. FEMA refuses to aid undocumented immigrants. We say: distribute aid to everyone, no questions asked. That would be “legal” residents, of course, as those lacking the required documents are not eligible for relief. Even though day laborers from El Centro del Inmigrante in Port Richmond, Staten Island were among the first to respond in the aftermath of the storm, and workers from the Hot and Crusty bakery in Manhattan (who after almost two months on the picket line won a contract with a union hiring hall) volunteered in Far Rockaway, they themselves would not be eligible for official aid. The Amsterdam News (6 December) reported, “As FEMA officials, National Guard and other storm rescue teams made their way around devastated neighborhoods, immigration groups say that many undocumented residents have remained hidden, not getting the help they need.” For those who are not citizens or have “qualified alien” status – in other words the vast majority of the more than half a million undocumented immigrants in New York City – the only “relief” they got after Sandy was that the ICE (Immigration and Customs Enforcement) cops said they were only conducting “limited street enforcement operations” … for now. But soon they would be back to normal, filling their quota of 400,000 deportations a year. Aid should be provided to one and all, no questions asked, but this is not the way capitalism works. Revolutionary Marxists demand not only that everyone be given needed assistance, but that there be full citizenship rights for all immigrants – a simple democratic right that it will take a socialist revolution to achieve. The issue of the state was starkly posed in the aftermath of Hurricane Sandy. Communists would not stand in the way of troops actually providing aid, but this is definitely not their principal activity – not in New Orleans, not in New York and certainly not in Haiti, where U.S. troops carried out a colonial occupation. Nor is there any great distinction between the police, National Guard and FEMA (Federal Emergency Management Agency), which is, after all, a branch of the Department of Homeland Security, where it is in charge of prison camps in case of a “national emergency.” This did not deter sections of the Occupy movement from fraternizing with the forces of bourgeois repression. On November 10, Occupy Sandy organized a meeting in Red Hook together with representatives of the National Guard, the Bloomberg administration, and the NYPD. The right-wing New York Post (6 December) even gushed that “A surprising alliance of cops and activists in Red Hook pulverized crime....” Despite mass arrests, a large part of Occupy still thinks Bloomberg’s killer cops are among the “99%”. “Do It Yourself” Disaster Relief? “Mutual Aid” with the NYPD? Top: Occupy Sandy organizer briefs men in U.S. military uniform in Brooklyn, November 10. Middle: meeting that night of Occupy Sandy, NYC mayor's office, New York Police Department and National Guard. Bottom: jont disaster relief center of Occupy Sandy and NYC mayor's office. If the story of New Orleans in the aftermath of Katrina was vicious racist repression, the story of post-Sandy New York was how non-existent official support was supplanted by private volunteer efforts. Even semi-governmental disaster relief organizations like the American Red Cross did little for days and turned away volunteers. Occupy Wall Street in particular, re-baptized “Occupy Sandy,” took up the slack from the bourgeois state, distributing water, food and aid, and cleaning up rubble. This earned praise from much of the bourgeois media (“Occupy Sandy: A Movement Moves to Relief,” New York Times, 11 November). Meanwhile, a whole range of reformist left groups, from Workers World to the International Socialist Organization, followed Occupy’s lead. As a consequence, while volunteers were kept hanging out in Red Hook waiting for something to do, there were almost no protests against the criminal negligence of NYC authorities. City officials were more than happy to let Occupy do the heavy lifting. Showing solidarity, helping others in the wake of such catastrophes is elemental, and Occupy’s efforts were praiseworthy. But some have argued that the political message was “revolutionary.” An Occupy supporter posted a piece on the internet site Firedoglake on 12 November, insisting “Occupy Sandy Does Not Signify Occupy Wall Street Has Found ‘New Purpose’.” The writer argues: “What Occupy is doing with its relief effort is revolutionary. The establishment expects disaster relief to be apolitical. But, being helped by an organizer from Occupy Sandy undoubtedly introduces or reminds residents of economic and social issues of justice and equality that remain pervasive in communities.” Perhaps to some small degree, but mainly the message is that Occupy cares. Many star entertainers put in a shift or two, and even vampire squid Lloyd Blankfein, CEO of Goldman Sachs, did a stint out in the Rockaways. 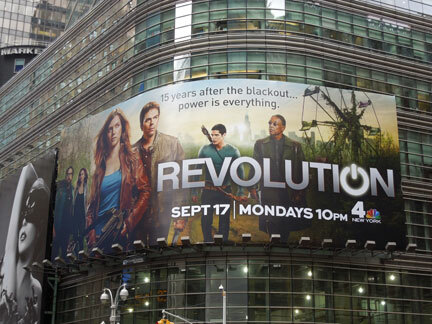 Of course, that was just a PR stunt while Occupy activists worked their butts off. But far from finding this threatening, Bloomberg & Co. cynically used the volunteers’ efforts. The situation in NYC now is hardly like that after the Mexican earthquake of 1985, in which tens of thousands of Mexico City working people who were left homeless organized independently of and against the government whose soldiers prevented them from rescuing their neighbors and relatives. Even in that case, the various self-proclaimed socialist groups that took charge of the organizations of those affected by the quake turned them into agencies for channeling government welfare funds, thus squandering an opportunity for revolutionary class mobilization. Ultimately, due to the absence of an independent working-class alternative, the wave of discontent and unrest over the long-ruling PRI-government’s criminal response to the earthquake was diverted into the popular-front electoral opposition around longtime PRI leader Cuauhtémoc Cárdenas (see our article, “Mexico 1985: From the Earthquake to the Popular Front,” The Internationalist No. 20, January-February 2005). The Occupy Sandy response, while positive, had a liberal middle-class quality to it, including using an Amazon “wedding registry” to get specific donations. But the “community support” undertaken by Occupy can only slightly ameliorate things in a desperate situation, and isn’t an alternative to action by the state. It cannot provide emergency generators and external boilers, pump out flooded subways lines or replace salt-encrusted electrical equipment. “Mutual aid” of the sort held up as a model by liberals and semi-anarchists within Occupy is a mirror image of the claptrap about “self-help” spewed by right-wing Tea Party populists. And it certainly can’t prevent future catastrophes like Sandy, which will require large-scale investment, which the government will not undertake unless the capitalists see it in their interests – and if so, it will be to protect Wall Street, not Red Hook or the Rockaways. What’s posed is the need to struggle for a revolutionary workers government that can marshal society’s resources in the collective interest rather than for private profit. “Having been to housing projects in New Orleans, post-Katrina, where authorities were trying to force residents out by cutting off essential services, what’s happening in Red Hook, post Sandy, has an eerie familiarity…. Even right-wing reactionaries could see the parallels to what happened in New Orleans housing projects. A Huffington Post (9 November) article quoted Howard Husock of the Manhattan Institute, a conservative “free market” think tank, calling this “a slow-motion Katrina for public housing residents.” Of course, Husock’s preference would be to privatize the projects, which is probably what the Bloomberg administration would like to do as well – or else blow them up, like city governments, both Republican and Democrat, have done across the country. But that could be problematical in NYC, which depends on low-wage labor, so instead city officials have adopted a policy of deliberate neglect. Fair-weather disaster relief. Above: Broad Channel, Queens, Nov. 2. 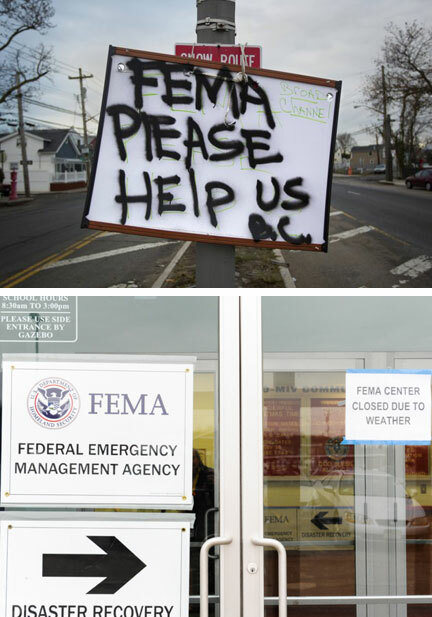 Below: Sign on the office door of Tottenville FEMA center in Staten Island, Nov. 7. (Photos: Shannon Stapleton/Reuters [top]; Stephanie Keith/DNAinfo [bottom]. As everyone who went out to volunteer in Red Hook, Coney Island or the Rockaways noted, and even the bourgeois media reported, the government was almost nowhere to be seen aiding residents. (In fact, when a nor’easter storm hit a few days after Sandy, FEMA and the Red Cross simply left.) The elderly and infirm were trapped for days in the high-rise towers without light, heat or elevators. On November 6, a 101-year old woman in Knickerbocker Houses on Manhattan’s Lower East Side died in her freezing cold apartment. There was no door-to-door check on the well-being of residents of Red Hook Houses until more than two weeks after the hurricane. It took the NYCHA three weeks to get to Coney Island. When the city finally got around to sending out mobile medical vans, children and babies with bronchitis and other respiratory diseases were given some antibiotics or a prescription (to be filled where?) then sent back into the cold. Where were the large generators which should have rolled up at the projects on Day One? FEMA had prepositioned “400 industrial-size power generators ready to help the East Coast,” but in New York City “not a single FEMA generator has been deployed” (Wall Street Journal, 2 November). Where were the soup kitchens, the heating centers? Why couldn’t they hook up outside power and heat to the first couple floors of the projects and give everyone somewhere warm to sit and have a meal? The Housing Authority’s excuse is it had more than 400 buildings housing almost 80,000 residents that lost power. That raises the question of why so much public housing was located in low-lying areas vulnerable to the sea. The answer to that is Robert Moses, who built projects on cheap land formerly occupied by slums or shuttered industries. In terms of the immediate crisis, in a society with a collectivized economy, the whole population would be organized to take care of emergencies like Sandy. One need only look at how Cuba deals with annual hurricanes of far greater ferocity with very little loss of life. But under capitalism, the poor are left to fend for themselves. “They earn close to $200,000 a year, ride in city-owned cars, live in tony Manhattan apartments — and are sitting on hundreds of millions of dollars intended to benefit low income New York families. “The New York City Housing Authority and its board members have failed to spend nearly $1 billion that it has been hoarding since 2009 to make life more livable for the 400,000 residents of its 334 developments, the Daily News has learned. Nearly half a billion of the unspent dollars have been sitting in the NYCHA accounts for at least two years, the article reported, and $233 million since 2009. Bloomberg and Rhea refused to respond to the Daily News exposé in August, and they’re still stonewalling. So why hasn’t the money been used? Because the policy of the Bloomberg administration is to run public housing into the ground. The Housing Authority is administered in the same way the billionaire mayor tries to run the schools: with highly paid Wall Street execs who know nothing about the public agencies they preside over and whose task is to make them fail and provide an opening for private capital. In the same mold as former magazine publisher Cathy Black, whom Bloomberg named schools chancellor although she had never set foot in a public school, NYCHA chief John Rhea was the former managing director for investment banking for Lehman Brothers. When Lehman went bankrupt, largely due to its investment banking practices, Rhea became available and fellow Wall Streeter Bloomberg snapped him up. His priority was to cut the $50 million annual operating deficit. In pursuing this, Rhea set off an exodus of experienced managers and has come up with a plan to carve up green spaces and lease them to private businesses to set up shops or parking lots. Fixing elevators, elevating electrical equipment and boilers? Fuggedaboudit is the city’s response. National Guard providing hurricane relief? Not hardly. Patrolling Red Hook, October 29. The failures and abuses of New York City’s response to Hurricane Sandy are legion. Asked about the 11,000 prisoners in the huge Riker’s Island jail, Bloomberg replied that there was no possibility of their escaping. What he was actually being asked was whether they might be drowned, a question he ignored since there were no plans to evacuate it. The restoration of power and the fact that most public transportation started running again after a few days were mainly due to the tireless efforts of subway, rail and electrical workers. Yet Con Ed workers were locked out this summer by a profit-hungry management out to gut their health plan, while the MTA docked hundreds of transit workers’ pay for supposedly being “missing” when they couldn’t get to work during and after the storm. At union initiative, thousands of teachers volunteered at relief centers on election day, November 6, but the DOE demanded that any who didn’t show up three days after the storm, when there was still no subway service and schools were closed, “prove” they couldn’t get there. Beyond the wanton vindictiveness of city rulers, Hurricane Sandy highlighted the utter inability of capitalism (and particularly the American “free market” variety) to plan and produce to fulfill human needs. In recent decades there has been a considerable deterioration of infrastructure in the United States, with collapsing bridges (Minneapolis 2007), periodic large-scale power blackouts (1965, 1977, 2003 just in the Northeast U.S.), recurrent river flooding (Mississippi, Missouri and Red River of the North in 2011 alone), leading to vast suffering and human tragedy due to inadequate preparation, maintenance or preventive measures. In impoverished and semi-colonial capitalist countries, where human life is judged to be cheaper by the capitalist exploiters, the losses due to lack of safety measures are even greater, as in Mexican mine disasters and the recent factory fires in Pakistan and Bangladesh, in which hundreds of workers died. When the focus is constantly on jacking up profits, spending large sums to prepare for predictable disasters is deemed a threat to the bottom line and stock market prices. In the case of Sandy, while the storm itself may have come about due to a particular conjunction of natural events, the devastation it left in its wake was a man-made disaster waiting to happen. Most of the damage in New York City was caused by the storm surge, which was made more destructive by the rising sea level that scientists concur is due to climate change. A massive (652-page) official report on Responding to Climate Change in New York State last year included a section on dangers to transportation by Dr. Klaus Jacob of Columbia University who noted that a surge only a foot higher than that in 2011’s Hurricane Irene could flood the subway tunnels and potentially shut down mass transportation into Manhattan for a month (New York Times, 11 September). Less than a year later, Sandy produced surges of up to 17 feet, and sure enough, all the southern Manhattan subway tunnels were flooded as well as the Midtown railroad tunnels. Thanks to the dedicated subway workers, it took far less time than feared to pump them out and restore service, but still the disruption was enormous. What is striking is that all of this has been studied exhaustively by climate scientists, engineers and others and preventive measures proposed, but virtually nothing has been done about it. Tunnel flooding and subway shutdowns could be prevented at relatively small cost. Watertight doors to the subway tunnels and stations and sealing gratings in the flood zones and simple measures like raising the threshold of entrances (walking up a few stairs before descending) would largely do the job. But that would require spending a few tens of millions of dollars, which the Metropolitan Transit Authority has refused to do because it is paying over $2 billion a year to Wall Street banks. Con Edison estimated that installing submergible switches and elevating high-voltage transformers above ground level would cost $250 million or so, which it considered prohibitive. Yet as we noted last summer, Con Ed “made over $1 billion in net profit last year, and a 15% a year return on capital over the last decade and a half!” (“Bring Out Workers Power to Knock Out the Lockout,” Internationalist leaflet, July 2012). Longer-term countermeasures would be more costly, such as constructing flood gates at the upper end of the East River (Throgs Neck Bridge), under the Verrazano Narrows Bridge and in the Arthur Kill, which might cost $10 billion. Storm surge barriers and dikes would add more. But such constructions have been built in the Netherlands and London and are nearing completion in Venice, and the cost is far less than the estimated $50 billion losses produced by Hurricane Sandy (to say nothing of the $100+ billion annual bill for the Iraq/Afghanistan wars). The issue is not the money, but who gets it and whose class interests are served. Now that it may have dawned on the titans of finance that their own operations can be affected, some such measures may be forthcoming. But you can bet your last stock option that they won’t be protecting the projects in Far Rockaway and Coney Island, and they would rather turn Red Hook into a tidal wetlands securing Wall Street (unless the real estate interests succeed in pushing the poor black and Latino residents out of the public housing there). Then there is the matter of reconstruction, centered on housing. The sudden need to provide shelter for thousands of people threw a sharp spotlight on the question of homelessness in New York. Even before the hurricane hit, the city was sheltering “a record 47,000 women, men and children, in a system strained to the breaking point” (New York Times, 21 November). Unaffordable rents, foreclosures and evictions, poverty and continuing mass unemployment have produced a huge housing crisis, which the aftereffects of Sandy only exacerbated. It’s not that there isn’t available housing, or space to build: a citywide count by Picture the Homeless in collaboration with the Hunter College Center for Community Planning and Development, Banking on Vacancy: Homelessness and Real Estate Speculation (January 2012), identified some 3,500 vacant buildings that can house 70,000 people, and 2,500 empty lots which could be used to build housing for another 130,000, for a total of 200,000 people. In the past, great amounts of public housing have been built in New York City, but in this epoch of decaying capitalism, that is not in the cards. It will take a revolution to solve this crisis. Faced with a catastrophe of this magnitude, a society in which resources are organized to fulfill urgent social needs would have no difficulty responding. The more than 20 million jobless in the United States (counting those who have been simply eliminated from the workforce by government statisticians in order to make unemployment stats look better) could be given jobs at union-scale wages building large quantities of new, high quality public housing, refurbishing and flood-proofing subways, constructing sea walls and the like. Not just in NYC but all along the devastated Jersey Shore. Power and telephone lines in densely populated Long Island can be put underground where they belong. Etc. But not under the system of production for profit and real estate monopolies. What’s necessary, therefore, is to fight for workers revolution, to lay the basis for a rationally planned socialist economy that can fulfill these needs. And we can begin that fight by mobilizing the working class, the poor and their allies in a struggle for transitional demands which challenge the capitalist framework. Communists fight for jobs for all, through a shorter workweek with no loss in pay. There should be a massive program of public works to rebuild New York and all the affected areas. Various social-democratic groups (Socialist Action, Socialist Alternative, International Socialist Organization and others) as well as centrist pseudo-communists like the Spartacist League and League for the Revolutionary Party raise such demands, as do some bourgeois liberals. But as the systematic victimization of housing project residents by the NYCHA and the perverse actions of MTA management show, even publicly owned entities are run according to the rules of the capitalist markets. The social democrats also call for “public ownership” and even “nationalization” of utilities and banks. But as shown by the performance of the Long Island Power Authority, state ownership under capitalism in no way means that such entities will be run in the interests of the working people they supposedly serve. That is why we insist that such programs must be under workers control, not by politely petitioning City Hall or the state legislature in Albany but by workers literally driving out management. In the process, workers commissions to open the books can discover what the bosses have really been spending money on. Likewise, public housing should be run by councils of tenants and workers, who elect the necessary administrators. Schools should be controlled by teachers, students, parents and workers – the ones actually involved in educating rather than agents of Wall Street. And as with any workers action such as a strike, we can assume that the owners of capital will seek to retaliate with their uniformed thugs and enforcers, from the police and National Guard to the armed forces. Occupy activists can chant all they want that cops are supposedly part of the “99%” but they will find out that the police are the armed fist of the capitalist state. In the face of this, it is necessary to organize labor, black and immigrant self-defense to defend against racist attacks and state repression. And the goal must be a workers government, which can expropriate the banks and all of capitalist industry and commerce, smash imperialism and spread the revolution internationally. The issue is state power, and which class has it. Out of calamities like Sandy can come some limited reforms, such as the building codes passed in the wake of the Great London Fire of 1666 and the San Francisco earthquake and fire of 1906 – which were then promptly ignored by cost-cutting capitalist builders. And/or they can be used by imperialist rulers to carry out barbaric attacks on those they exploit and oppress. Examples: the racist police terror and “ethnic cleansing” driving the poor, black population out of New Orleans following Hurricane Katrina, and the “humanitarian” U.S. military occupation of Haiti after the January 2010 quake. Or the study of the 1871 Peshtigo, Wisconsin fire by Pentagon planners in WWII seeking to reproduce conditions for a firestorm, knowledge they then used in dropping incendiary bombs on Dresden and Tokyo producing death tolls as high or higher than those of the atomic bombing of Hiroshima and Nagasaki. Having been to housing projects in New Orleans, post-Katrina, where authorities were trying to force residents out by cutting off essential services, what’s happening in Red Hook, post Sandy, has an eerie familiarity. Beyond the DOE [New York City Department of Education] nasty harassment, making teachers “prove” and “appeal” why they can’t get to school in the middle of a catastrophe where the trains aren’t running into the most-affected areas, Brooklyn is sealed off, people are trapped in their flooded homes in Jersey, Long Island is still without power, NYU Hospital and now Bellevue are evacuated because of failing back-up power, and we in lower Manhattan are still living in the Netherworld of Darkness, the New Yorkers who are suffering most terribly right now are in Red Hook. To get the people in the Red Hook NYCHA projects to leave, the city gratuitously turned off their electricity, water and gas before the storm – this was not a result of Sandy but a deliberate attempt to force them out. Many decided to stay anyway as they needed to project their property and did not have family or friends in other places. Now, four days later Red Hook project residents still have no heat, no gas, no electric. Many cannot shop in the small bodegas that are open in the area, because these stores require cash only, and many folks do not have cash, but food stamps. According to NPR, food stamps are not being accepted because the system is down. The city did truck in Meals-Ready-to-Eat tonight, after they practically starved everybody out. With all the mutual praise and back-slapping over this city’s response to this catastrophe (which engineers have warned of for years), the nightmare in Red Hook, a deliberate man-made disaster, is being virtually ignored. As one gentleman said on the radio today, there’s racism, and then there’s Hurricane Racism. And let’s not forget that this is the same area where the DOE, Bloomberg and mega-billionaire hedge-fund operators have been trying to destroy community schools like PS15 with their charter school co-locations. It’s all about class and race. The New York City government has been a special enemy of poor people in times of disaster, preventing people from even helping each other. Poor people in the Rockaways including children, have had no heat, light, food, water, for 72 hours. When a local Sikh temple came down with pots of curry and rice they were hassled by the NYPD. They were insistent, and have been providing the only hot meals available. Bloomberg announced vaguely that some surplus army k-rations were found and will be sent out. He doesn’t even know to where! Bloomberg doesn’t like questions. He reads from a prepared statement which he occasionally garbles because an underling wrote it. He acted as if he didn’t realize that restoring regular bus service did nothing for millions of people who could only get into Manhattan from Queens and Brooklyn by subway. If anyone asks him anything, he just says nature is dangerous, and if people don’t evacuate he says, then it is their own fault and nothing can be done. He then adds, “That’s enough questions. They are becoming repetitive.” All he cares about is that the stock exchange is open, and money keeps flowing in to Bloomberg, Inc. The U.S. capitalists generally are not the smartest ruling class in the world. They just have the most guns – which is often the decisive factor in interimperialist competition. But they are not too bright. In San Francisco there was an earthquake in 1989. The Bay Bridge connecting Oakland and San Francisco lost a single panel of the upper roadway. It fell onto the lower roadway in hinge-like fashion, making the bridge uncrossable. The authorities could have retrofitted that bridge, at relatively low cost, reinforcing it so that it would withstand the worst imaginable quake. Instead they decided to try to build a completely new bridge. Well, guess what? The quake was 23 years ago and the “new” bridge is still not complete. In China, with its planned economy, as bureaucratic as it is, this bridge would have been finished and in use long ago. Bloomberg and his billionaire friends personally have the means to pay for the construction of a New York harbor dike, or massively outfitting the subway, rail, and power systems to make them as safe and watertight as one of the Pentagon’s precious aircraft carriers. But the ruling class is decrepit and decadent, increasingly non-productive, bent on super-exploitation and theft by financial fraud. Bloomberg wants to go to Bermuda every weekend on his private jet? Well, maybe he should just stay there permanently. Jim Cannon once suggested shipping the top capitalists off to an island – he had Catalina Island off Los Angeles in mind, but Bermuda would do. Trotsky said that if the capitalist system cannot provide a basic livelihood for the people, then it deserves to perish!